I am fascinated by technologies that extend human vision, and how the discoveries they make possible advance human understanding. Through microscopes we marvel at seeing the foundations of life, magnified to the cellular, molecular, and atomic levels, and at the beauty and symmetry of zigzag and ribbon and star shapes of diatoms. We learn that things infinitesimal and colossal share shapes, such as the golden spiral manifest in rivers seen from space and the structure of the human lung. The Higgs Boson particle is visually akin to the energetic designs of Medieval Islamic art. Through Edgerton's stroboscopic camera we witness the nanosecond of a bullet shattering an apple. Through telescopes we probe the mysteries of the cosmos: dark matter, dark energy, black holes, remote galaxies. We even transcend time and space, viewing images of the early universe and the birth and death of stars. These technologies allow the human eye to see the previously unseen. Paradoxically, while we base what we know on what we see, what we see and hence what we know, continually changes as our knowledge increases through new technology. The medium in the works in “Parsing the Universe” is watercolor monotype, a unique print painted in watercolor on nonporous plexiglas and run through a printing press. Watercolor monotype exploits the luminosity and transparency of watercolor, and allows for successive layering options through multiple runs of the repainted plexiglas through the press. The printing process also captures the interactions of water, color and gravity, including the “watery” mark. 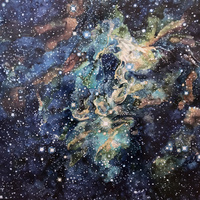 My visual interpretations of cosmic images depend on the technology of the printing press, which, like the microscope and telescope, translate natural forces (in this case, the force of the press transferring the image from plexi to paper), thus making possible images of the universe of nature, which aim to similarly expand and enhance human understanding. Enter the Center through the 3rd floor doors and proceed directly ahead to the show.